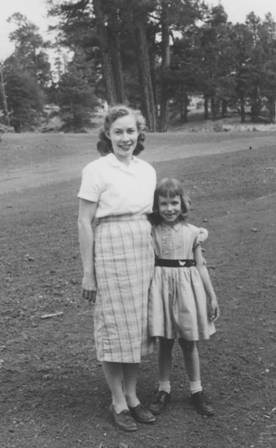 This photo is of my mom and me, taken when our family lived in Flagstaff, Arizona. I think I was four or five years old in this photo. I really enjoyed Flagstaff, since you really experience the changing seasons there, including getting lots of snow in the wintertime. This was all new to me at the time, since I was born in Phoenix, of desert-y dryness. In the winter, one might need a sweater, but not a coat. This entry was posted on Wednesday, November 21st, 2007 at 8:28 pm	and is filed under Favorite Photos, Memories. You can follow any responses to this entry through the RSS 2.0 feed. Both comments and pings are currently closed.